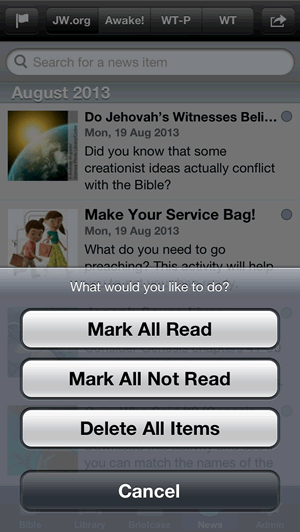 Mark All items in the current list as "Read"
Mark All items in the current list as "Not Read"
Delete All Items - this clears the list - the equivalent of swiping on each item one-by-one clicking "Delete". 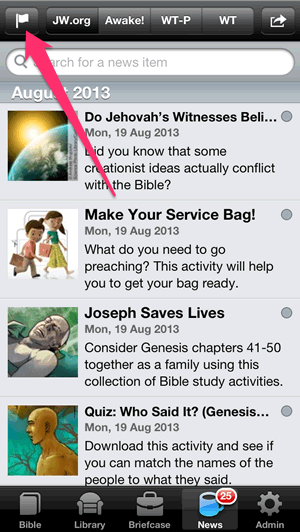 Important: Only the first list of news items from "JW.org" contributes towards the "Unread Count" that shows on the main News Tab. The magazines do not influence this number at all. Note: If you want to reset the whole list and show the latest RSS data afresh, then click the Action button top/right and choose "Restart the List".